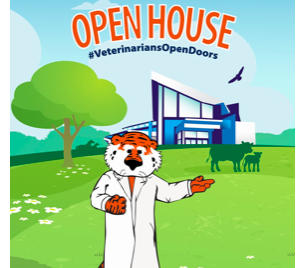 Our annual Open House will be held Saturday April 6, rain or shine, on the CVM campus. This event highlights all Auburn University College of Veterinary Medicine offers our community in areas of veterinary medicine, research and education. There will be many demonstrations and exhibits about animals highlighting all veterinary medicine has to offer. The Open House is organized and conducted by veterinary students and staff volunteers. The more than 30-year tradition showcases the variety of educational opportunities offered through the veterinary medical profession. 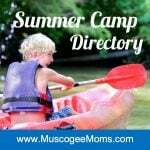 The event is held on AU CVM campus located at 1010 Wire Road Auburn, AL. No registration is required to attend Open House. The event starts at 8:30 am and ends at 2:00 pm. The event includes self-guided tours of the Bailey Teaching Hospital facilities throughout the day. Other exhibits include AU Detector Dog demontration, Southeastern Raptor Center birds, Exotic pets, Teddy Bear Surgery, Dinosaur Egg with embryo, Caine Parade of Breeds and many other exciting events. Open House will also include exhibits in the JT Vaughn Large Animal Hospital including the Equine and Bovine Display of Breeds, Petting Zoo and painted horse.